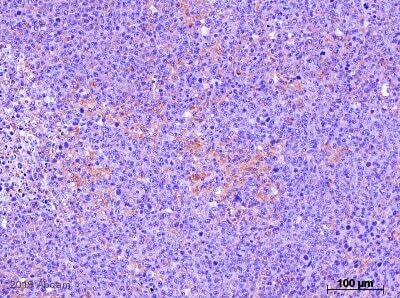 Based on the antibody's immunogen sequence, it recognises 151 kDa VEGF receptor 1/Flt1, splice isoforms sFlt1 (77 kDa) and sFlt1-14 (82 kDa), and isoform 4 (61 kDa). The sequence is not present in isoforms 5-8 based on Uniprot ID P17948. Synthetic peptide within Human VEGF Receptor 1 aa 1-100 (N terminal). The exact sequence is proprietary. WB: Mouse brain tissue. IHC-Fr: Mouse brain tissue. Our Abpromise guarantee covers the use of ab32152 in the following tested applications. WB 1/1000 - 1/5000. Predicted molecular weight: 151 kDa. 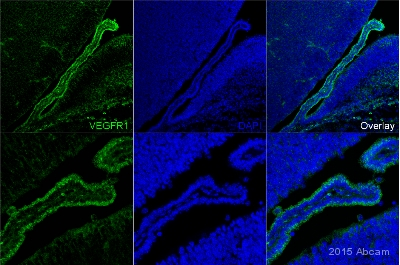 Immunohistochemistry (Formalin/PFA-fixed paraffin-embedded sections) - Anti-VEGF Receptor 1 antibody [Y103] (ab32152)Image from Sano, M et al., PLoS ONE. 2014 Mar 20; 9(3). Fig 2E. DOI 10.1371/journal.pone.0089830. Lymphangiogenesis and Angiogenesis in Abdominal Aortic Aneurysm., e89830. Immunohistochemistry (Formalin/PFA-fixed paraffin-embedded sections) analysis of human abdominal aortic aneurysm (AAA) wall tissue sections labeling VEGF Receptor 1 with ab32152 at 1/100 dilution. 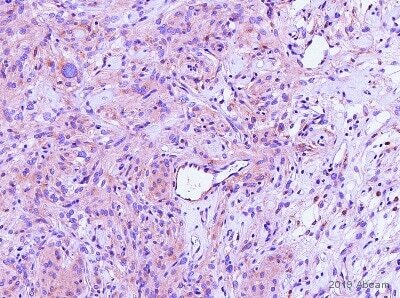 Resected aortic tissues were immersed in 10% neutral buffered formalin for at least 24 h for immunohistochemical staining. Tissue sample was embedded in paraffin; 4 µm sections were cut and mounted onto MAS-coated slides. The sections were deparaffinized, dehydrated, and boiled in a pressure cooker in 0.01 M citric acid buffer (pH 6.0) for 20 min. The sections were washed with phosphate-buffered saline and incubated with 3% H2O2 in absolute methanol for 5 min to inhibit any endogenous peroxidase activity. 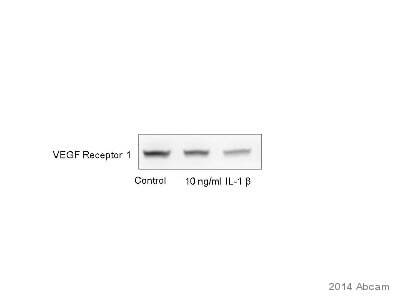 Sections were preincubated with 3% normal goat serum for 20 min to minimize nonspecific binding to VEGF Receptor 1, and incubated with ab32152 at 4°C overnight in a moist chamber. 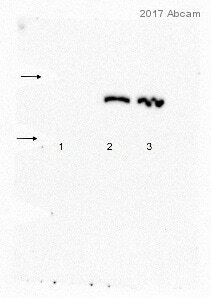 The section was washed with phosphate-buffered saline and then incubated with the appropriate secondary antibody for 30 min at room temperature. 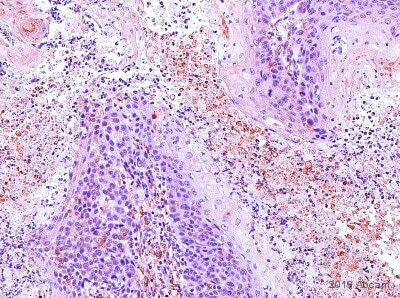 Staining was visualized with Vector DAB, and tissue section was then counterstained with hematoxylin. 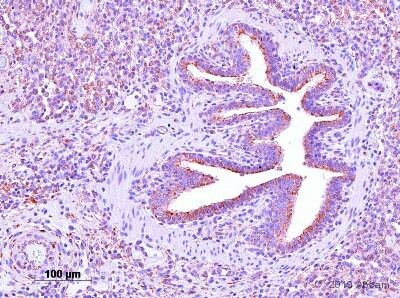 Immunohistochemistry (Frozen sections) - Anti-VEGF Receptor 1 antibody [Y103] (ab32152)This image is courtesy of an anonymous abreview. Immunohistochemistry (PFA perfusion fixed frozen sections) analysis of mouse brain tissue section (15 days old wild-type mouse embryonic brain, 16 micron) labeling VEGF Receptor 1 with ab32152 at 1/300 dilution. Tissue was fixed with formaldehyde and permeabilized with Triton X-100. 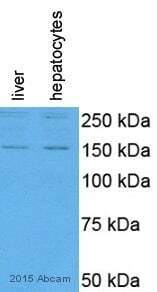 Heat mediated antigen retrieval was performed using 10mM citrate buffer, pH 6. 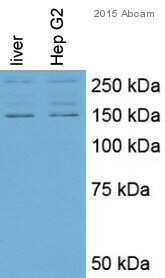 A polyclonal donkey anti-Rabbit IgG (H+L) (Alexa Fluor® 488) secondary antibody was used at 1/500 dilution. Publishing research using ab32152? Please let us know so that we can cite the reference in this datasheet.